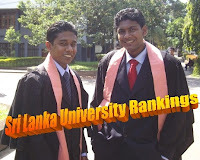 Sri Lankan Universities, Campuses and Higher Education Institutes World Rankings 2013 released. According to the Webometrics the 2013 Sri Lankan Universities Rankings are as follows. LankaUniversity-News has compared Year 2013 rankings with 2012 Rankings.